I had no idea he was so prolific. I read Dirty Snow (also from NYRB) and really enjoyed it. Although it was so macabre, I am not sure enjoy would be the right word. 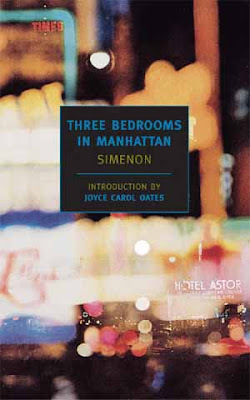 I have to say I prefer Simenon's Maigret novels to what he described as his "romans durs" but there is no doubt in my mind that he is a great novelist, and it is marvellous that the NYRB recognises his greatness by republishing him. There is a wonderful Maigret site at www.trussel.com, which often touches on the life and background of Simenon. Yes, Thomas, 'enjoy' might be the most accurate word to describe the Simenon reading experience, but I know what you mean. Prolific barely covers it either, extraordinary to have written so much. I've no idea if he managed to maintain the quality with such output, perhaps you know more, Roddy, and thank you for the link to that site - I shall have a look. I think it is fair to say that Simenon did maintain the quality of work throughout his lengthy and prodigious career, though I detect a falling off in his last Maigret novels. He may have recognised that himself, as he declared his retirement from writing in the early 70s. What happened was that he gave up writing fiction and then wrote an enormous amount of autobiographical material. Among his romans durs, Pedigree seems to be the most acclaimed novel. Again, it is semi-autobiographical. He was greatly admired by serious novelists, including Andre Malraux and Albert Camus, and in many ways his books share the existentialist point of view which brought Camus and Sartre fame in the 1950s. Thank you so much for the detailed comment Roddy. You can come back again! Thanks for covering this book, William. I have really enjoyed the 3 romans dur I've read to date. I've been a little wary of the American novels, but it seems Simenon carries through that bleakness I find so compelling across geographical settings.